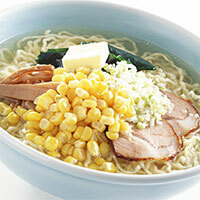 Shio ramen is just one type of Ramen, Japanese noodle soup. In difference to Tonkotsu, Miso, and Shōyu, Shio ramen is probably the oldest and the saltiest type of ramen (‘shio’ itself means ‘salt’). Shio ramen is a clear soup that contains a mixture of different vegetables, seaweed, and chicken or fish. When you look at the numbers, it may seem to you that shio ramen isn’t really a good choice due to its level of carbs. However, seaweed and fish are there to boost your immune system with a number of vitamins and minerals. Also, people with lower blood pressure can benefit even more, as salt was proven to can help in raising blood pressure. The calories in Shio Ramen per 555g(1 cup) is 477 calories. Shio Ramen is calculated to be 86Cal per 100 grams making 80Cal equivalent to 93.02g with 72.54g of mostly carbohydrates、18.65g of protein、10.27g of fat in 555g while being rich in vitamins and minerals such as Selenium and Vitamin K.